Today we told our tenant that he would have to start looking for another place to live. It is heartbreaking, we love our tenant, and we know he made plans, which tell you he would stay for a while. If we had the money, I would buy the place for sale two doors down, and rent it to him at the same price, but last time we won the lottery, it was a meager $3. Granted, we had always planned to tear down the cottage, someday when we actually have the money to afford it. I guess the restaurant gods needed an instant sacrifice. The highlight of the day, to E! 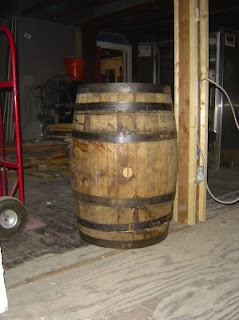 for sure, was when we picked up a used bourbon barrel, which E! is going to make her beer vinegar in. Thank you so much, Ed, I told you, you're going to be my wife's new best friend.